Named after a town in Costa Rica visited by proprietor Hallot Parson, Escazu Artisan Chocolates has been churning out otherworldly concoctions since 2008. Parson works alongside the talented Danielle Centeno, a native of Venezuela and Culinary Institute of America trained chef. Escazu employs traditional methods of sorting, winnowing and grinding and uses a vintage 1920s roaster and stone grinder imported from Spain. The grinding process lasts four days, allowing for sugar crystal reduction and evaporation of volatile flavors. The result? Superior handcrafted bars and an ever-evolving assortment of confections. Besides eclectic truffles and confections like clove orange and honey chamomile, popular bars include the best-selling 65% dark chocolate with sea salt and 74% chipotle chili. Decadent hot chocolate is prepared drawing from rare recipes of yesteryear. Despite cramped production space and limited seating capacity, the business boasts wholesale accounts coast-to-coast, including all Whole Foods locations in the Southeast. 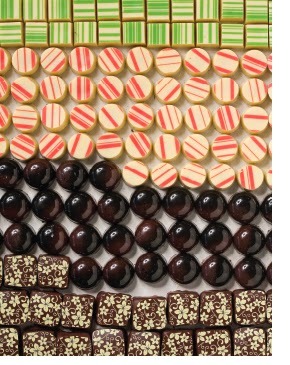 Confections range from $1.65 to about $2 apiece. Chocolate bars cost $6.50-$6.99. Ended up are definitely the times when pieces were definitely mere timekeeping tools. rolex replica sale At this time, they need grown that they are products. These produce defined fact related to an individual's temperament with your layout quotient. tag heuer replca sale They're just impressive products which can also strengthen an individual's wardrobe together with get you to are similar to a method famous or simply hurt the design to your dress. breitling replica sale Moreover, they're just some sort of guage to your community popularity overly. replica watches sale For this reason, one must always decide on a see which unfortunately complements an individual's wardrobe with your temperament. That will make an impression wheresoever everyone choose, dress in Maxima pieces. rolex replica The type provides a numerous watch for every last appearance you ought to flaunt.